Shop online today and enjoy up to 30% off a great selection of Beats by Dre headphones. Shop for Beats accessories online and enjoy up to 20% off your purchase. Enjoy an extra $5 discount on the Beats pill + free shipping. Click link to shop. 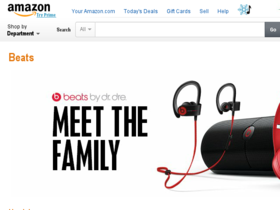 Shop online and take advantage of free shipping on select items from Beats By Dre. For a limited time only, take advantage of over 60% off heartbeats headphone from Beats by Dre.